I need an artwork graphic design for the package box. 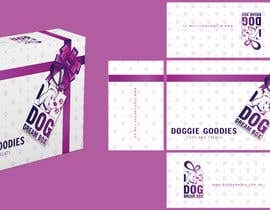 The box is for monthly supply of dog toys and dog treats. The box should look like a gift box, it would be good to have some gift ribbons or similar look, but all ideas are welcome. Dimensions are L 300 x W 195 x H 120. The background will be white and all the artwork should be purple. The logo should be on the box (ideally would be to have a logo on the top and both side sides but not necessarily), and files are provided. The website address [login to view URL] should be written on the box as well. We will also create a one or two sentences text thats gona be on the box too as a company slogan, but please use some default text for now until the slogan is ready. I WONDER WHERE DOES Khalid GOT THE CLIP ARTS/STOCK IMAGES? I wouldn't know that, you can ask him or do you maybe know? have you any sample if you like? the app doesn't allow me to upload any photos from my phone, send me a message and i will sens you back my hand drawing. it doesn't have to be like that, its just an example. Please read the project description carefully, few people didn't read and they submitted just a logo?? The colour must be uniform purple on white background.